The significance of The History of the Peloponnesian War lies in the fact that it is one of the earliest examples of a “scholarly” history. Thucydides was quite conscious of what he was attempting to do, as underscored by his stated desire for The History to be “judged useful by those inquirers who desire an exact knowledge of the past as an aid to the understanding of the future.” Yet, the work is not merely a detailed account of the twenty-seven year war between Athens and Sparta, it also serves as a classic piece of literature. Moreover, as is normally the case with ancient Greek literature, the work also serves as a philosophical outlook on the nature of humanity. So, The History gets studied by historiographers, literary scholars and philosophers alike. However, while all of those attributes are noteworthy, there is one other seemingly random characteristic of The History that is of particular interest to me. That is, Thucydides uses the word kindunos (Greek noun for “danger”) a quite noticeable two hundred times. The word sticks out not only because of its general overuse, but because Thucydides specifically goes out of his way to use the word in ways that are grammatically awkward. In other words, there are moments when there are better words to use than kindunos, and when Thucydides employs the word in those moments it begs the question of what point he is trying to make. So, what point is Thucydides trying to make? According to Grissom and other scholars Thucydides used the term in order to show that there were two different types of dangers. There were the dangers that come at people externally, and there were dangers that were internally generated. Every external danger generates internal responses. Some of the external dangers that were perceived were considered legitimate. Some of them were not. Some of the internal responses to those dangers were considered noble. Some were not. The noble internal responses included things like decisiveness, courage, self-confidence, adaptability, patriotism, etc. Some of the ignoble internal responses included things like impatience, fear and anger, to name a few. Thus, Thucydides spent his efforts not only accounting for various events that transpired during the Peloponnesian War, but revealing the perceived dangers that lie both without and within the heart of human groups and individuals. What is my interest in all of this? The word, kindunos, only shows up in the bible two times. The first time that it shows up is in a question in Romans 8:35, “Who shall separate us from the love of Christ? Shall trouble or hardship or persecution or famine or nakedness or danger or sword?” However, it is the second appearance of the word that is most intriguing. It is found in Second Corinthians, where Paul used the word a remarkable eight times in a single verse, “I have been constantly on the move. I have been in danger from rivers, in danger from bandits, in danger from my fellow Jews, in danger from Gentiles; in danger in the city, in danger in the country, in danger at sea; and in danger from false believers” (2 Corinthians 11:26). Perhaps the only thing that someone could have done to outdo Thucydides’ use of the word danger two hundred times in his short history, was to use the word eight times in a single sentence. What is Paul doing by outdoing Thucydides? Certainly both Paul (as an educated Pharisee) and his audience (living in the Greek city of Corinth) would have been very familiar with The History written by Thucydides. It would have been a classic, more than 450 years old at the time. And while modern day readers have to study and analyze in order to catch the nuance implied by Thucydides with his overuse of the word danger, the rhetoric would have been quite obvious to Paul’s audience. In other words, Paul is consciously using the words, appealing to the imagination of his readers by connecting his message with a theme they had all learned in school and/or pop-literature. That is, there are two kinds of dangers in the world. There are dangers within, and dangers without. Some of the dangers within are legitimate. Some are not. Some of the dangers without are legitimate. Some are not. However, while Paul starts by connecting his message to the work of Thucydides, he quickly takes the underlying cultural message and flips it upside down. 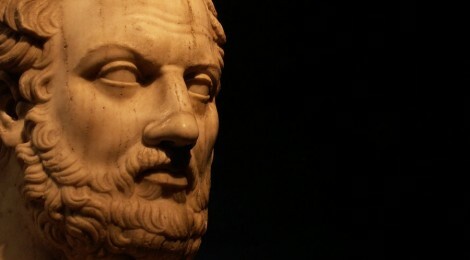 Thucydides wrote on the dangers of war, as well as both the cowards and heroes who fought in them. In Thucydides’ mind, as well as in popular Greek culture, heroism was determined by internal strength that produced things like courage, determination and nerve. This was not only a value in Greek culture, but in Roman military lore as well. The highest Roman military award, similar to The Medal of Honor in the American military, was called corona muralis. It was a military decoration reserved for the first soldier to scale the wall in a besieged city. It was that type of valor that Thucydides had in mind when he wrote about the danger of succumbing to internal pressures caused by external dangers. Paul boasts not in his internal fortitude, but in the security of his standing in Christ. He sees himself as a soldier of the cross that is looked at as more of a fool for Christ than a self-determined war hero celebrated by Greek and Roman culture. Thus he says, “In this self-confident boasting I am not talking as the Lord would, but as a fool” (2 Corinthians 11:17). He goes on to discuss his beatings and sufferings instead of his victories and valor (especially verses 24-29). While those are unattractive by human standards, they were the things that Paul pointed to first because he was determined to show his weakness, “If I must boast, I will boast of the things that show my weakness” (2 Corinthians 11:30). The volume in Paul’s speech seems to steadily and dramatically rise as he works his way through his message. He is at a near fever-pitch when he takes that beloved Roman decoration, corona muralis, and turns it completely upside down, “In Damascus the governor under King Aretas had the city of the Damascenes guarded in order to arrest me. But I was lowered in a basked from a window in the wall and slipped through his hands” (2 Corinthians 11:32-33). Paul was not running into the face of danger; he was running away from it. He was not the first soldier lowered into a besieged city; he was the first one lowered out. Because Paul employs some sarcasm in this letter we often read this as if Paul is acting humble, while secretly realizing that these are all noble actions in the sight of God even if scoffed at in the eyes of the world. However, Paul is not using some tricky, false humility here. He is genuinely showing us what a clown he is. Paul goes on to reveal that he had things in his life that he was begging God to remove (2 Corinthians 12:7-8). Yet, God refused to do that for Paul. And He explained to Paul that His power could be made perfect in Paul’s weakness (2 Corinthians 12:9). So, Paul comes to this culminating conclusion, “Therefore I will boast all the more gladly about my weaknesses, so that Christ’s power may rest on me. That is why, for Christ’s sake, I delight in weaknesses, in insults, in hardships, in persecutions, in difficulties. For when I am weak, then I am strong” (2 Corinthians 12:9-10). It is, indeed, a dangerous world. There are things coming at you from without and from within. There are forces that want to destroy you, and there is a cultural message that claims that you can muster up uncommon valor, pull yourself up by your bootstraps and be the first to scale new walls of opposition, and in so doing you will be celebrated and rewarded with a hero’s welcome. But do not believe that cultural lie. You are every bit as much of a fool as the rest of us. And the quicker you accept that the quicker God’s power can be made perfect in your situation. Make the same choice that Paul made. Give up on becoming a hero and determine to boast in your weakness, so that Christ’s power may rest on you.